Gideon is from the Aeron – Kirill litter and has just started his show career. At 5 months of age, and being the youngest puppy at his very first shows, he earned a Reserve Bred-By Exhibitor Best In Show puppy, Reserve Best Puppy in Show, 2 Bred-By Exhibitor Puppy Best in Shows and a Best Puppy in Show out of 4 shows. He also earned his CGC (Canine Good Citizen), CGCA (Canine Community Dog) and his CGCU (Canine Urban Dog) in one day. What a way to start a show career! Gideon has passed his eye test, is N/N on the HU gene, is clear for JLPP and has tested as dominant black. Gideon finished his Rally Novice title at 6 months and his Rally Advanced title at 11 months. 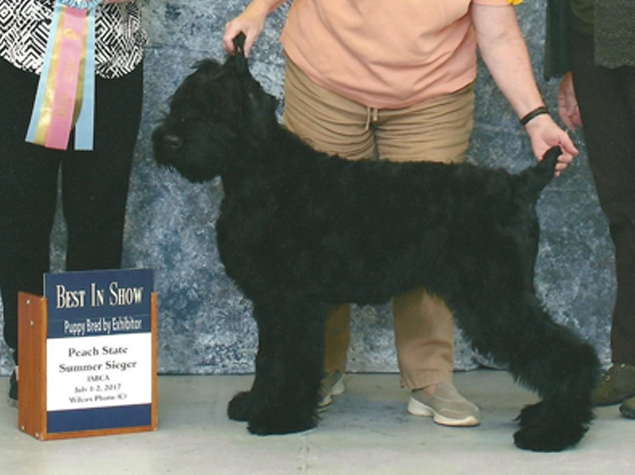 He finished his AKC Championship at 14 months with 3 majors. Watch for him in the breed, rally & obedience rings where he will be working on his Rally Excellent before he heads back to get his Grand-Championship.